Specializing in the Music of the Nineteenth Century on period instruments and voices. Recreating the small orchestra featured in parlour and ballroom performances of long ago with instruments including violin, tenor violin, cello, flageolets, walking stick recorder, flute, serpent, ophicleide, ballad horn, alto saxhorn, tenor horn, tuba, banjo, guitar, piano, reed contrabass, alphorns, autoharp, bagpipes, voices and more. The Fireside Social Orchestra’s large repertoire includes quadrilles from “Foster’s Social Orchestra” published by Stephen Foster in 1854, music from the Aurora Colony (established in 1856) and other music from Old Oregon, songs with lyrics by early Oregon author/suffragists Abigail Scott Duniway and Eva Emery Dye, fiddle tunes from Ireland, England and America, shape-note songs from The Sacred Harp (1844), Christmas Carols in their original forms, early ragtime music, marches, light classical music, early American political songs and much more. Directed by Phil and Gayle Neuman of The Trail Band and The Oregon Renaissance Band, the Fireside Social Orchestra consists of 4 to 8 musicians, depending on the repertoire. Members include Ben Fitch, Laura Kuhlman, Cindy Markham, Gayle Neuman, Phil Neuman, Cal Scott, Robert Dolan and Elizabeth O’Connor. Some of the instruments played by The Fireside Social Orchestra. 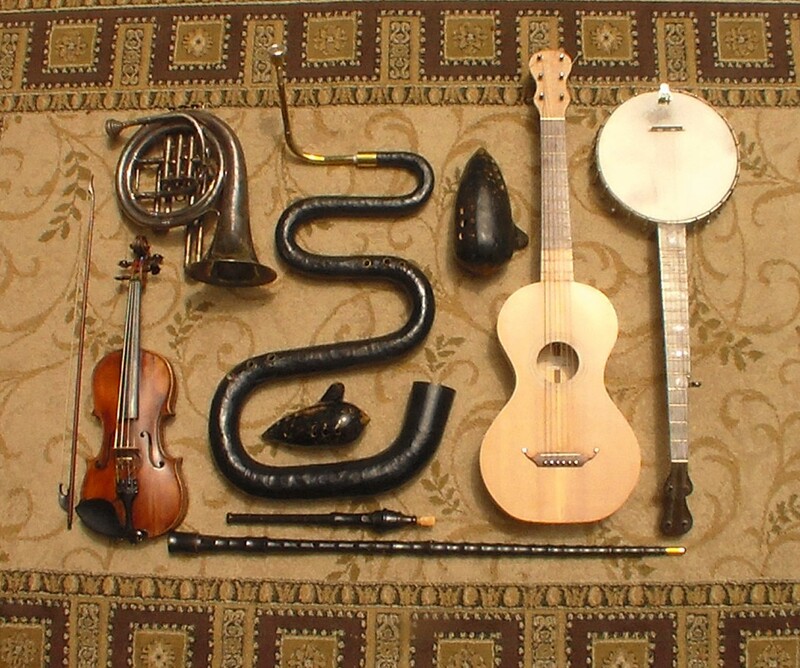 Top row, left to right: ballad horn, serpent, bass ocarina, guitar, banjo; second row: violin, tenor ocarina; third row: flageolet, fourth row: walking stick recorder. 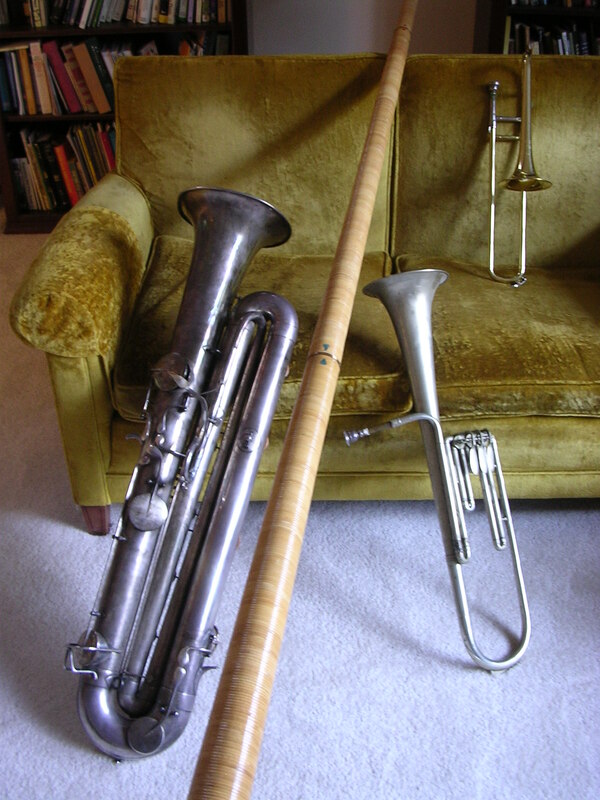 In the photo below, left to right: reed contrabass, alphorn, alto saxhorn, soprano trombone.